From 2001 to 2010 Myaudittsucks.com gets email complaint about defective Audis. The Audi car problems and service advisor stories are always the same. It's time for you to standup and fight back with your personal website stories. and you do nothing about it. problem fix_ it as quickly as_ possible. _I paid_ $28,000_ for this car (purchased new) and regret every penny. Audi's or Volkswagens since 1984.
if I have the car in my possession....ttyl.. thanks again! I have just shot of my first volley to Audi UK threatening legal action. and make a case from it. at least add to the pressure. I am fighting mad and will put my time into it. _____read it first. I wonder if Consumer Report was paid to do the report like they did? Highs: Interior craftsmanship, all-wheel drive. Lows: Ride, noise, shifter feel, view out. the TT is one of the least-expensive cars here. beyond its limits, it tended to plow--lose grip at the front wheels--a bit earlier than the others. 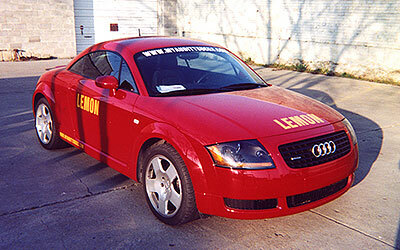 But the TT acquitted itself well in our avoidance-maneuver test. transmission has well-chosen ratios but has a shifter that feels vague. An automatic is not offered. gearbox. Braking performance was excellent overall. and out of the car takes dexterity. ___-The gauges are easy to see and controls are nicely lit. a folded wheelchair. A temporary spare stores beneath the floor. available. A government side-impact test predicted no or minor injury for the driver. fit well. Rear-facing infant seats may require additional bolstering to position them properly. an extended dealer stay. The TT has a worse-than-average reliability record.